Psalm 19 tells us that the heavens declare the glory of God. But what do the heavens declare about the age of the universe? The actual body of the comet, called the “nucleus,” is very small, ranging from 1 to 30 miles (1–50 km) in diameter. It also has very low density, certainly less than that of water. Earth-based observers cannot see the nucleus. Instead they see only the gases and dust particles that come from the nucleus, including a large glowing gas ball, called a coma, and the ion and dust tails. The gas (ion) tail is blown away from the sun by solar wind, and the dust tail is forced back by the pressure of photons. The presence of tails and comas tells us that comets are constantly losing mass. A comet is a ball of ice and rocky dust particles (as seen in this image of Hale-Bopp). The ion tail (blue) points away from the sun and is blown back by its interaction with solar wind. The dust tail (yellow-white) is swept back by radiation pressure. It sweeps behind the comet due to its orbital motion around the sun. These time-lapse images show the disintegration of the Schwassmann–Wachmann 3 (S-W 3) comet. This comet disintegrated over the past several decades. The Hubble telescope captured detailed photos of its breakup. 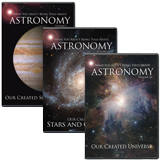 Comets, as well as their orbits, are greatly affected by the planets. For instance, Jupiter has corralled about 45 comets within its orbit and evidently can destroy comets; Jupiter’s gravitational field can cause comets to break apart and even collide with the planet itself. In addition, the SOHO spacecraft has regularly recorded comets being completely destroyed as they encounter the sun. Many comets have been observed to break up or at least partially disintegrate. In 1852 Comet Biela was observed to divide in two, and in 1872, a meteor shower appeared in its place. Indeed, nearly all meteor showers are linked to the disintegration of known comets. It is apparent that comets are temporary. And from their orbits, we find that comets do not just fall in from interplanetary space. They appear to be true members of the solar system, and so they are limited in number. If the solar system were 4.6 billion years old, our complete supply of comets should have been exhausted long ago. Instead, comets are plentiful. Likewise, the shorter period comets are believed to come from the Kuiper belt, a disk of icy asteroids beginning at the orbit of Pluto (40 AU) and extending out to about 55 AU. But such objects have different characteristics from the comets, so they cannot explain the wealth of comets we see today. The Moon is Still Alive . . . 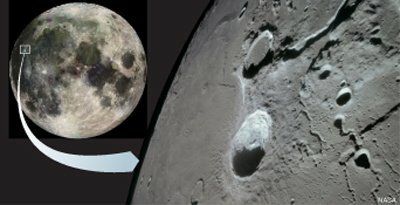 The moon is very much alive, geologically speaking. Ever since telescopes have been available, observers have been reporting many color changes, bright and colored spots and streaks, clouds, hazes, veils, and other phenomena on the moon. Since these phenomena are short lived, they are called Transient Lunar Phenomena (TLP). These speak of geologic activity. Over 300 transient lunar phenomena have occurred in the Aristarchus region of the moon, indicating that the moon is young, just as the Bible says. From 1900 to 1960, many of these observations were dismissed and ignored because the prevailing belief was that the moon is 4.5 billion years old and has been geologically dead for the last 3 billion years. (As the argument went, since the moon is about one-fourth of the size of the earth, heavy masses would fall to the center, the moon would cool much faster than the earth, and no magma would be left.) But the number of TLP observations became so overwhelming that mainline publications began to discuss them. In 1968, NASA published the Chronological Catalog of Reported Lunar Events. As early as March 1787, William Herschel, the discoverer of Uranus and an ardent lunar observer, reported, “I perceive three volcanoes in different places of the dark side of the moon. Two of them are either extinct, or otherwise in a state of going to break out. . . . The third shows an actual erupt ion of fire, or luminous matter.” The next night he continued, “The volcano burns with greater violence than last night. I believe the diameter . . . to be about three miles.” More than 300 TLP’s have been seen in the Aristarchus region alone. This and hundreds of similar observations point to the youthfulness of the moon, as the Bible tells us. We have been taught that solar system bodies shine only by reflected light. Is this true? No, not for the Jovian gas giants, Jupiter and Neptune. In fact, the power excess for Jupiter is 3 x 1017 watts.1 Jupiter actually radiates nearly twice as much power as it receives from the sun, but mostly in the infrared. That’s enough power to continuously burn three million-billion 100-watt light bulbs. Saturn puts out half the energy but is one-quarter the mass, so it produces twice the energy per unit mass than Jupiter. Neptune gives off well over twice as much energy as it receives. Uranus’ energy production is somewhat in doubt, but even it appears to give off slightly more than it receives. This means that each of these three planets has an alternate energy source. What is it? Jupiter puts out nearly twice the energy it receives from the sun. This makes sense if the planet is only thousands of years old. Researchers3 have hypothesized that nuclear reactions are occurring in the core of Jupiter as a result of burning deuterium (heavy hydrogen). This requires a core temperature of 160,000 K, some 8 times hotter than the present models of Jupiter. Will this produce the extra energy? To make this work, most of the deuterium available throughout Jupiter had to simultaneously descend to its core when Jupiter formed so the deuterium would be hot enough to ignite. Once it ignited, it would burn happily for 10 billion years or more and keep Jupiter hot. This would give us a hot Jupiter like the one we see today. At first, this solution appears to be ingenious. The snag is that the deuterium layer has to assemble itself at just the right time and at the right place to sustain Jupiter’s core temperature. The same unlikely event must be repeated on Neptune. The definition of a star is any large, self-gravitating gaseous sphere with continued nuclear reactions in its core. Our sun is a star. It burns hydrogen in its core. But if Jupiter and Neptune have nuclear reactions in their cores, then they are dwarf suns. There would be three suns in our solar system. There is a simpler explanation. God created the Jovian planets. The heat energy comes from the creative work of God and any gravitational energy produced since then. Since they are young and quite massive, the Jovian planets have not had time to cool down. 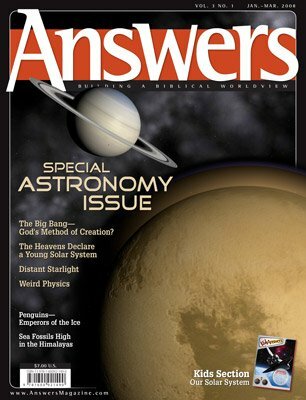 Are hot Jovian planets a problem to creationists? Absolutely not! They are only a problem to evolutionists. Spiral galaxies rotate much too quickly for an old universe. They would be twisted beyond recognition if they were really as old as secular astronomers claim. The magnetic fields of planets and moons in our solar system are consistent with their age of a few thousand years, but are much too strong for an age of billions of years. The debris shed by disintegrating comets is what causes meteor showers. Since earth intersects such a debris field once each year, most meteor showers are annual. 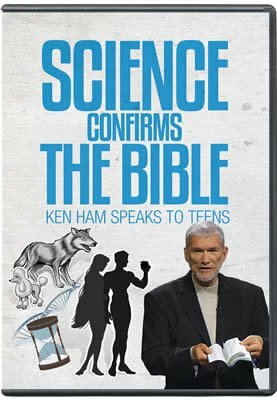 The Bible can be trusted in every area it addresses, including its scientific and historical truth. It is God’s Book, which means what it says in a plain, forthright manner. While the Bible’s revealed insights about science and history glorify the Creator and help us know Him better, its main purpose is to convey to people, like you and me, our need of Jesus Christ as Savior and God’s desire for us to live a fulfilled, joyful life with Him. Previous Article Subscriber Exclusives Next Article The Gospel Message—Written in the Stars? The excess power output of Jupiter is 3 x 1017 watts. The sun’s output is a hundred million times larger, or 9.7 x 1025 watts.